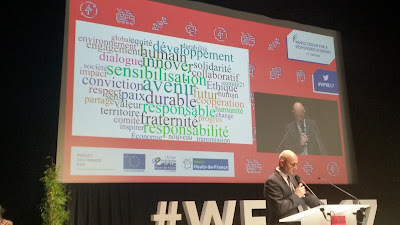 Tiberius Brastaviceanu presented SENSORICA at the World Forum for a Responsible Economy in Lille, France, between 17 and 19 October. This session will hear about real world examples of how companies have transitioned to responsible organisations by focusing on different business models, re-engineering their value chain, redirecting inside out and outside in linkages, highlighting new technologies and other kinds of innovation, fostering future of work practices, and building new bridges of collaboration with peers, partners and civil society. The session will include speakers from diverse sectors who will share deep insights into the topic, shedding light on their own experiences and perspectives. It will help the audience to grasp what are the real requisites of the change towards responsibility as demonstrated through practical cases.